I know there are all kinds of reasons why married people are not wearing their wedding ring. To name a few that I have heard: “I don’t like to work out in my rings so I took them off, I lost my ring, I can’t fit my ring, I left my ring at home, we are not on good terms etc.” Although some people don’t respect a marriage ring when they see one, the ring is a visual sign that you are taken, married and not available. Your behavior should say the same. The ring is a representation of your spouse especially when you are not physically in each other’s presence. When you get married, you and your spouse become one. Wherever you go, you are no longer just representing yourself, you represent each other and most importantly, you represent Christ. The ring is a never ending circle that represents the everlasting love of God and the love that He wants us to have in His institution called marriage. So this week I want to encourage all of those who are married to wear your wedding ring even if you have to wear a temporary ring until your ring is fixed, or replaced. If you have been wearing your ring all along, keep up the good work! 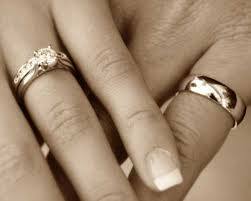 Remember your ring is an outward sign of an inward bond and commitment that was only meant to be broken by death!